Aminata Savadogo is a talented young singer, born for music. She is defined as an independent and ambitious girl who is willing to constantly develop herself. Her amazing voice, great performances and astonishing look will set the bar for the new generation. She aims to spread her positive, energetic music, creative performances and share them with people all around the world. Aminata hopes to get into audience hearts as a talented and unique artist. Aminata was born on 9 January, 1993 in Riga, Latvia to a Latvian mother and a father from Burkina Faso. Savadogo graduated from Bolderaja Music and Art School, flute department, where she studied for 9 years. She is currently International Economic Relations department student at the University of Latvia. She started singing at the age of 13. At age 15, she took part in the Latvian television show "Krodziņā pie Paula", organised by the popular Latvian composer Raimonds Pauls. Before and after that she took part in different song contests for children in Latvia and other Baltic countries, such as "Joulukohtumisse" in Estonia, and "Baby Sing" in Lithuania. At the age of 17 she started to sing backing vocals for Latvian popular singer Janis Stībelis. With him she took part in "Muzikālā banka" show and for the first time appeared at national Eurovision preselection, finishing 7th. She also took part in recording of his "Diapozitīvi" and "Day by day" albums. Savadogo also took part in "Koru kari 3" (Battle of the Choirs) together with "Riga Golden Sun" choir, finishing 3rd. Then, also in 2013, breakthrough comes to her with participation in Latvian TV show "Jaunā talantu fabrika" as a soloist, where she won first place. Her mentor in the show was Latvian singer Dons, who also acted as jury member in the first stages of Supernova. In 2014 Savadogo competed in "Dziesma 2014", national preselection for the Eurovision Song Contest with "I Can Breathe" qualifying to the final and finishing 5th. In early 2015 she tours with Harijs Bašs trio, performing Jazz program, her shows are booked till 8 March. Her debut album is planned for release on 28 March, 2015. At the Eurovision Aminata will perform her self-written song "Love Injected", produced by Kaspars Ansons. "It is a positive song about deep true love, that can at the same make you weak, worried and emotional, and at the same time giving you strength to overcome all problems and make you happy. Love is a force that is able to revive the long-forgotten, but sometimes bring completely new and unknown feelings that one is able to find and explore. "Love injection" can heal the deepest wounds of the past and make forget about them forever"
Supernova finalist Markus Riva will be announcing results of Latvian voting during the Eurovision final. EBU has released today some photos from postcards of the artists, who have already finished filming 2nd part of their postcard in Austria. where Aminata joined Austrian performance artist Willi Dorner with a group of performers and together they turned Salzburg into an art landscape. Singer and songwriter Aminata Savadogo has released four remixes of her Eurovision Song Contest 2015 entry “Love Injected”: [Ex] da Bass Radio Mix, [Ex] da Bass Club Mix, Makree remix and Tommy U & Tob Luii remix. Dance music specialist of Radio Pieci.lv, DJ Rudd has selected the most acknowledged Latvian DJs and producers for this job. One of the selected DJs, [Ex] da Bass says: "When I heard “Love injected” for the first time, I was sure that this song might win. I think that this year Latvia has an actual chance to get through the semi-final and I am sure that Europe will understand us this time". The young and talented DJ Makree has also created his own “Love Injected” version. "I was pleasantly surprised by the new and modern Eurovision selection contest this year in Latvia, and the winner's song turned out to be very fresh as well! I immediately agreed to make remix for “Love Injected” and the result is amazing! ", says Makree. Energetic and progressive house music is a specialty of another two producers Tommy U & Tob Luii's. In Baltics Tommy U & Tob Luii are easy to recognize by their Scandinavian sound that can also be spotted in their “Love Injected” remix. "We see a great potential for Aminata because of her unique voice and lack of accent that allows her to express herself in English in excellent quality. We believe that she is one of the most promising upcoming stars in Latvian pop scene," adds Tommy U & Tob Luii. Tracks can be purchased at ekase.lv. Austrian television film crew has arrived in Riga for filming of Aminata Savadogo Eurovision postcard. You can watch report of Galina Solodovnyk, LTV7, in Russian, here. Filming began at 7 am. Austrian cameraman has captured both Opera House, and the Castle of Light and Daugava - all the most beautiful and significant places of Riga. According to the script, postman on bike delivers to Aminata a parcel with a gift from friends from Austria. The role of Aminata's house was played by cozy wooden house in Ķīpsala. Shooting of the first part of the postcard has already been held in Salzburg, Austria, from where the singer has returned yesterday. 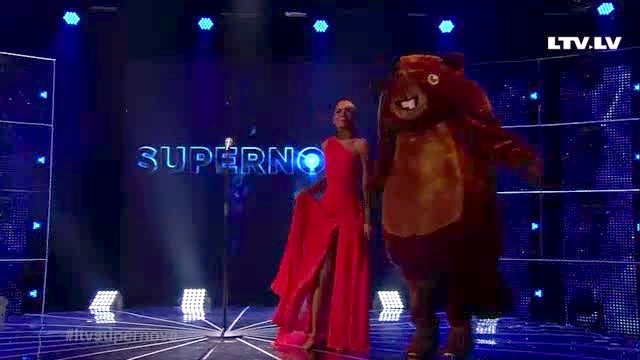 "In Salzburg, I was greeted by creative people, the Austrian artist with his team, he creates his art installations with figures of the live people and their bodies, and I had to be part of these figures"
New show "Supernova" has been chosen by LTV to select Latvia's entry for the Eurovision Song Contest 2015. 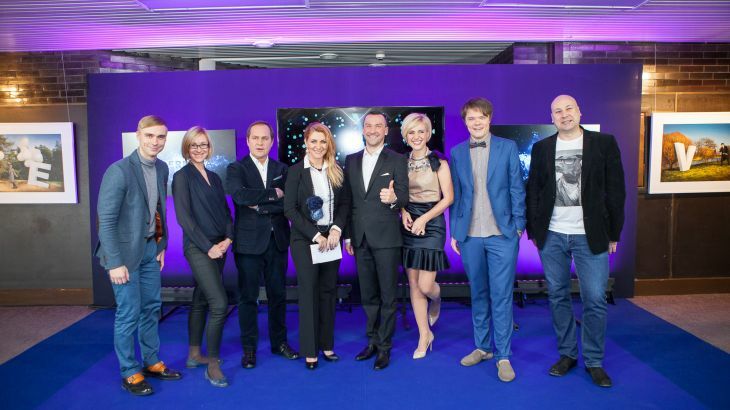 The competition is considered a separate show on LTV, thus has own organizing team and Eurovision participation is just one of the awards for the winning artist. The main contest aim is described as: "to create new stars and find the songs that will be able to conquer not only local but also foreign stage, radio stations and listeners hearts". Submission period run from 3 November to 10 December with separate submissions for songs (98 songs were received) and performers (123 applied). Local and international jury panels were appointed by LTV for the selection process: the international jury of Peo Nylén (producer and representative of Scandinavian Songs AB record company), Michael Jay (producer and songwriter) and Jarkko Nordlund (Universal Music Group Finland and the Baltic region manager) conducted the song selection and the local jury of Kaspars Roga, Guntars Račs, Dons and Ieva Kerēvica evaluated and selected the performers. Performer auditions took place on 5 January at LTV studios with 56 of the 123 applicants being invited to attend. On 13 January 2015, LTV announced the selected twenty performers and competing songs during a press conference, while the demo versions of competing songs were published on the next day. Rihards Saule replaced Gunārs Gaumīgs as performer of "Life Lines" and song "Dieva Dēli" originally having folk lyrics, has been reworked as "Sundance" by Arnolds Kārklis. You can read about participants of the show here in Latvian. "Supernova 2015" will take place at LTV Studio 6 in Riga hosted by Ketija Šēnberga with Pieci.lv radio DJ Toms Grēviņš interviewing participants in greenroom. "Supernova" will consist of two introduction shows on 18 and 25 January, three qualifications shows on 1, 8 and 15 February and final on 22 February. "Supernova 2015" stage will use nearly 300 different types of spotlights, 200 m LED strip, 72 m2 large LED screen, approximately 100 m wide variety of construction and 2000 m cable. Light is designed by "Kompānijas NA", that brings to the show creative team of Normunds Bļasāns, Pāvels Armanis, Raivo Rozenbriks and Janis Sniķers. Technician team is lead by Albert Adītājs and Normunds Adītājs is responsible for the installation of stage design. Read more about "Supernova" stage here (in Latvian). The first heats on 1 and 8 February will feature 10 performers each, with 4 (2 chosen by jury and 2 by televoters) chosen to proceed to the semifinal. Viewers will be able to vote on phone (1 call - 0.14 Euro) with up to 5 calls allowed, or SMS (1 SMS - 0.60 Euro equal to 5 votes), as well as on internet logging to the voting page through registration in social networks Twitter, Draugiem.lv, Facebook (maximum 1 vote from the account). From 8 entries in semifinal on 15 February, 4 again will be chosen to take part in the final (2 by jury and 2 by televoters). Four entries will compete in the final on 22 February 2015 where public voting solely will select entry will represent Latvia at the 2015 Eurovision Song Contest. During the competition, the jury panel has the right to reinstate an eliminated song if they believe the song has potential with an artist that is still active in the competition. Should this happen, the jury will replace a competing artist's song with the eliminated song. All shows will be aired on LTV1 (online) at 21.20. For the final, in addition to the main broadcast, viewers will also be able to watch an alternative stream "featuring live comments in a more tongue-in-cheek manner to make sure Eurovision's reputation for glorious kitsch is served as well as straightforward musical excellence". Alternative comments will be provided by comedy duo Transleiteris. Special guests of the final: Brainstorm, Dons, Bet Bet. Official hashtag for the show is: #ltvsupernova. Амината Савадого - талантливая молодая певица, рожденная для музыки. Ее можно определить как независимую и амбициозную девушку, которая желает постоянно развивать свои умения. Со своим сильным голосом голосом, завораживающей внешностью и необычными сценическими выступлениями она легко преодолевает планку, установленную для артистов нового поколения. Она стремится распространять свою позитивную, энергичную музыку, творческие выступления, делиться ими со зрителями по всему миру. Амината также надеется попасть в сердца зрителей, как талантливая и уникальная артистка. Амината родилась 9го января 1993 года в Риге, Латвия, ее мама - латышка, а отец - родом из Буркина-Фасо. Савадого закончила Музыкальную и художественную школу в районе Болдерая, отделение флейты, где занималась в течение 9 лет. В настоящее время она изучает Международные экономические отношения в Латвийском Университете. Петь Амината начала в 13 лет. В 15 лет она принимает участие в шоу латвийского телевидения "Krodziņā pie Paula", которое проводил известный латышский композитор Раймондс Паулс. Перед и после этого она выступает на различных детских конкурсах в Латвии и других странах Прибалтики, таких как "Joulukohtumisse" в Эстонии и "Baby Sing" в Литве. В возрасте 17 лет она начинает работать как бэк-вокалистка у популярного исполнителя Яниса Стибелиса (Jay Stever). Вместе с ним она выступает на шоу "Muzikālā banka" и впервые принимает участие в национальном отборе на конкурс Евровидение, заняв 7е место. Также она участвует в записи двух его альбомов - "Diapozitīvi" и "Day by day". Савадого участвует в шоу "Koru kari 3" (Битва хоров) в составе хора "Золотое солнце Риги", который в итоге занимает 3е место. Прорыв приходит к ней с участием в 2013 году в латвийской версии "Фабрики звезд" - "Jaunā talantu fabrika", где она занимает первое место. Ее ментором на шоу был известный певец Донс, который также являлся членом жюри в первых стадиях проекта Supernova в этом году. В 2014 году Савадого участвует в "Dziesma 2014", национальном отборе на конкурс Евровидение, с композицией "I Can Breathe", выйдя в финал, и заняв там 5е место. В начале 2015 года она дает тур с Harijs Bašs trio, исполняя джазовую программу, концерты по Латвии длятся до 8го марта. 28го марта в свет выйдет дебютный альбом певицы. На Евровидении Амината исполнит песню собственного авторства "Love Injected", спродюсированную Каспарсом Ансонсом. "Это - позитивная песня о настоящей глубокой любви, которая может сделать тебя слабым, обеспокоенным и взволнованным, но в то же время дает силы преодолеть все проблемы и делает тебя счастливым. Любовь - это сила, которая может возродить давно забытые, а иногда и приносит совершенно новые и ранее неизвестные чувства. "Инъекция любви" может исцелить самые глубокие раны прошлого и сделать так, что ты забудешь о них навсегда"
Финалист шоу Supernova Маркус Рива объявит результаты голосования Латвии в финале конкурса Евровидение. ЕВС опубликовал сегодня некоторые фотографии с визиток артистов, которые завершили уже съемки 2й части своей открытки в Австрии, где Амината присоединилась к австрийскому перфоманс-артисту Вилли Дорнеру и с группой исполнителей превратила Зальцбург в художественный ландшафт. Певица и автор песен Амината Савадого выпустила четыре ремикса на свою конкурсную песню с Евровидения 2015 “Love Injected”: [Ex] da Bass Radio Mix, [Ex] da Bass Club Mix, Makree remix и Tommy U & Tob Luii remix. Специалист по танцевальной музыке радио Pieci.lv DJ Rudd выбрал наиболее признанных латвийских диджеев и продюсеров для подготовки ремиксов. Один из низ, [Ex] da Bass говорит: "Когда я впервые услышал “Love injected”, то был уверен, что эта песня сможет победить. Я думаю, что в этом году у Латвии появился шанс выйти в финал конкурса, я уверен, что на этот раз Европе поймет нашу песню". Молодой и талантливый DJ Makree также создал свою версию “Love Injected”. "Я был положительно удивлен насколько свежим и современным был отбор на Евровидение в этом году в Латвии, и песня победитель оказалась тоже очень современной! Я немедленно согласился подготовить ремикс на “Love Injected”, и, как мне кажется, результат вышел потрясающим! ", говорит Makree. Энергичная и прогрессинвая хаус-музыка - специальность следующих двух продюсеров Tommy U и Tob Luii. В Прибалтике Tommy U & Tob Luii легко узнать по их скандинавскому стилю, который также легко читается и в их ремиксе на “Love Injected”. "Мы видим в Аминате огромный потенциал, прежде всего благодаря ее уникальному голосу и отсутствию акцента, что позволяет ей легко выражаться на английском языке. Нам кажется, что она является одной из наиболее обещающих исполнителей на латвийской поп сцене," добавляют Tommy U & Tob Luii. Треки можно приобрести на ekase.lv. Съемочная группа австрийского телевидения приехала в Ригу для съемок видеовизитки певицы Аминаты Савадого, которая выступит от Латвии на Евровидении в Вене. Репортаж Галины Солодовник, LTV7, на русском языке, можно увидеть здесь. Съемки начались в 7 часов утра. В объектив австрийского оператора попали и Оперный театр, и Замок света и Даугава - все самые красивые и знаковые места Риги. По сюжету, велокурьер должен доставить Аминате посылку с подарком от друзей из Австрии. Роль дома Аминаты исполнил уютный деревянный домик на Кипсале. Съемки первой части визитки уже прошли в Зальцбурге, Австрия, откуда певица вернулась накануне. "В Зальцбурге меня встретили творческие люди, австрийский художник со своей командой, его искусство заключается в том, что он делает фигуры из людей, и мне надо было быть частью этих фигур"
Новое шоу "Supernova" было выбрано телеканалом LTV для отбора песни Латвии на Евровидение 2015. Шоу является отдельным от Евровидения проектом на LTV, таким образом имея собственную команду организаторов, и участие в Евровидении является лишь одним из призов для победивших артистов. Цель шоу заявлена в том, чтобы: "зажечь новые звезды и найти песни, которые были бы способны завоевать не только местную, но и международную сцену, радиостанции и сердца слушателей". Период приема заявок продолжался с 3го ноября по 10 декабря. Всего было получено 98 песен и отдельно от них свое желание принять участие в отборе изъявили 123 исполнителя. Для проведения отборочного процесса телеканалом LTV были назначены местное и международное жюри. Международное жюри, в состав которого вошли Пео Нюлен (продюсер и представитель лейбла Scandinavian Songs AB), Майкл Джей (продюсер и автор песен) и Яркко Нордлунд (менеджер Universal Group по Финляндии и странам Балтии) провело отбор среди песен, а местное жюри из Каспарса Роги, Гунтарса Рачса, Донса и Йевы Керевицы оценивало и выбирало исполнителей. Прослушивания исполнителей прошли в студии LTV 5го января, на него были приглашены 56 из 123 кандидатов. 13го января 2015 года LTV на специальной пресс-конференции объявило имена выбранных 20 исполнителей и назначенные им 20 песен. Демо-версии самих песен были опубликованы на следующий день. Рихардс Сауле заменил Гунарса Гаумигса в качестве исполнителя песни "Life Lines", а песня "Dieva Dēli", первоначально написанная на народный текст, была переработана Арнолдсом Карклисом под названием "Sundance". Подробнее об участниках шоу вы можете прочитать здесь (на латышском). "Supernova 2015" проходит в студии 6 телеканала LTV в Риге. Проведет шоу Кетия Шенберга, а диджей радио Pieci.lv Томс Гревиньш будет брать интервью у исполнителей в гринруме. Всего в эфир выйдут 6 программ: два вводных шоу 18 и 25 января, три отборочных этапа 1, 8 и 15 февраля и финал 22 февраля. Сцена "Supernova 2015" будет содержать в себе почти 300 различных прожекторов, 200м LED ленту, 72 м2 LED экран, конструкции шириной почти 100 м и почти 2000 м кабеля. Световым дизайном занимается компания "Kompānijas NA" и творческая команда в лице Нормундса Бласэнса, Павла Арманиса, Раиво Розенбрикса и Яниса Сникерса. Техническую команду возглавляют Альберт Адитайс, а Нормундс Адитайс отвечает за установку сцены. Подробнее о сцене "Supernova" можно прочитать здесь (на латышском). В первых отборочных шоу 1го и 8го февраля выступят по 10 исполнителей, по 4 лучших из них (2 по выбору жюри и 2 - телезрителей) выйдут в полуфинал отбора. Зрители смогут проголосовать по телефону (1 звонок - 0.14 евро), где допускается не более 5 звонков, по СМС (1 СМС - 0.60 евро и равно 5 голосам), а также по интернету, залогинившись на специальную страницу голосования через профили в социальных сетях Twitter, Draugiem.lv, Facebook (максимум 1 голос с аккаунта). All performances in Final, Semifinal. Все выступления в финале, полуфинале.